To find out what EHRI can do to connect to new audiences, we started a special project and struck up a collaboration with MediaLAB Amsterdam, an interdisciplinary studio which is part of the University of Applied Sciences of Amsterdam, where students and researchers work together on innovative and interactive media research projects. Students work in multidisciplinary teams guided by experts from industry and the Amsterdam University of Applied Sciences. These experts are a mix of designers, programmers, social/digital media experts, researchers, copywriters and storytellers. In twenty weeks (one semester) the team develops a working prototype in co-creation with a client, in this case EHRI. EHRI met its MediaLAB team for the first time in early 2017. 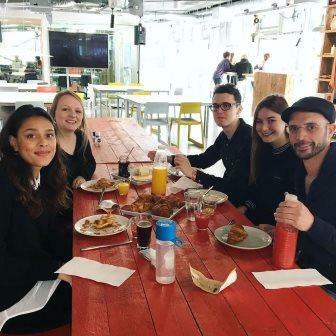 The four members were Sangheeta van Beemen (Media and Culture), Claire Farbrace (Heritage and Memory Studies), Grace Houghton (Interaction Design) and Bodgan Moroz (IT), and a mentor, Pavel van Deutekom. 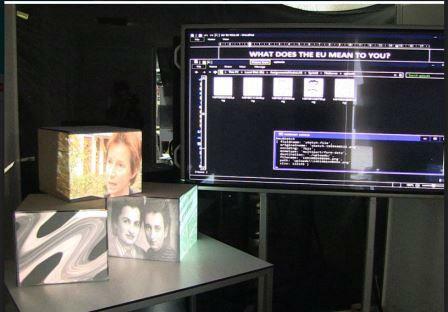 In six so-called ‘sprint sessions’ this team, together with EHRI, embarked on a mission to design a prototype that aimed to connect EHRI with a bigger, more general audience. This process emphasises lessons learned along the way as much as the final product, and this certainly was true in EHRI’s case. In addition to designing a working prototype, our collaboration with MediaLab enabled us to greatly clarify our goals and approach in regards to increasing public engagement. The first sprint was dedicated to one simple but vital question; what do we mean by a more general audience? This term is much too large and undefined to work constructively with. Through a survey the team found out more about our possible target groups. One of the most interesting results was that while the young adult group was highly interested in the Holocaust they had very low knowledge levels. As they gain a lot of their insight from the internet, this provided an obvious opportunity for a digital infrastructure such as EHRI. For the second sprint, the team investigated an important channel through which we reach our audiences: the EHRI partners. Who are their target groups and how do they engage with them? For the third sprint, three out of the box prototypes were designed to test how best to engage users with Holocaust-related content. Each of the prototypes tested engagement through comparison, through a game, and through human connections respectively. One of the insights was that the insertion of an element of choice into an interaction gives people a level of control over their experience. A game helps with fact recollection, while personalisation heightens engagement. An important overall conclusion was that it will be difficult for EHRI’s current resources to create value for these new customer segments. As the end of the semester drew closer, the fourth sprint had to deliver a first concept of an actual prototype. 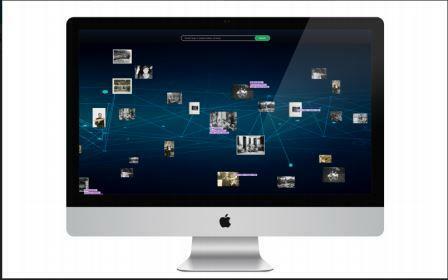 The team devised a web-based experience that allowed the general public to explore, tag and add data to photos from the EHRI network archive. Although the concept was well thought out and presented, and the idea was liked, this time the team of students learned something about reality and practicalities. This prototype would face so many obstacles that it would take years to make achievable. For this EHRI lacks the essential resources and as a result something simpler was preferred. To the credit of the team, for the fifth sprint they had another concept ready that was far more feasible and simple and by the end of the sixth sprint, we had our prototype with a name: Resonance. 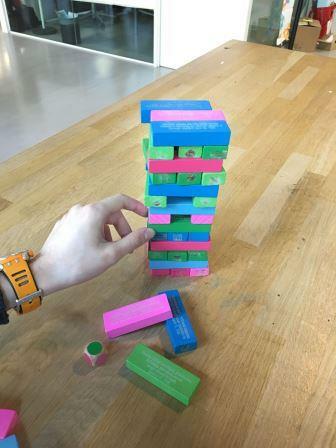 The basis for Resonance originated at the start of the project, when the MediaLAB team had quickly designed a first prototype, based on a Jenga game, to test knowledge levels. Now this was transferred to a website with two sides: Silence and Music. This experimental website presents Holocaust sources in new ways to engage the general public with historic information, stimulating interest in the topic whilst also being educational. Silence confronts website visitors with fictional, impossible choices based on anti-Jewish legislation in pre-war Germany. Music shows that even under the most difficult circumstances, people still have a voice as it tries to revive archival sheet music composed by Jewish musicians in ghettos and concentration camps. We invite you to have a look at Resonance yourself, but remind you that this is still a prototype, a work-in-progress, an experiment. Although the website works, it is unlikely to ever result in a finished product. Not only do we lack the resources for finishing it, Resonance also revealed that using Holocaust sources in this simplified, game-like way, first requires discussion within EHRI and between project partners. But that was the plan. EHRI learned a lot from this collaboration about its own goals. We realized that, unlike a common brand, we are not out to sell more “EHRI”. Our goal for a more general audience is to increase knowledge about the Holocaust, and perhaps raise awareness. Most importantly we discovered that there is no easy way to reach new target groups. There is no “EHRI light”, or quick fix that will make our resources suddenly interesting and appealing to whole new groups. Our resources are interesting and valuable, but you have to use them in different ways, present new concepts, think out of the box, so they can inspire new people again. What do you think of Resonance? 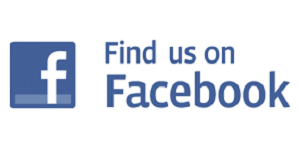 Please send your feedback to info@ehri-project.eu.